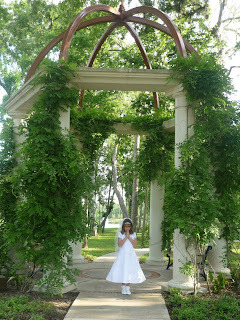 My oldest celebrated her First Holy Communion on Sunday. Many of our family and friends joined us at the special Mass for our Parish children celebrating the Sacrament. 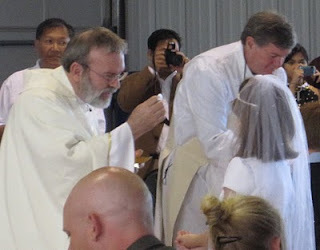 As I spoke and prayed with her the night before First Communion, it touched my heart to realize that she understands the importance and significance of receiving Holy Communion and truly believes that she actually receives Christ in the Eucharist. Children are so open to faith. They believe where so many adults question. Last week, as we said our daily prayers while waiting in the carpool line at school, I listened to her ask God for help in preparing her to receive Him in First Communion. For her, it wasn't about the dress, veil or outward appearance. She actively focused on the true meaning of the Sacrament. She found her joy in the excitement of receiving the body and blood of Christ for the first time. Indeed, after receiving her First Communion, her face radiated with joy. Everyone could see that it was a special moment. Added to that moment is the knowledge that she now will be filled with the Holy Spirit every Sunday as she continues to receive the Body and Blood of Christ. The weeks I spent with her in preparation for these two Sacraments enabled us to develop a special bond. She allows me to freely share my faith with her and through her I am witness to the beauty of unwavering faith. She fully understands the Eucharist at her young age in a way I didn't until I reached adulthood. My blessings go out to our Parish, Father John, and all the Catechists who aided in her preparation. They worked beautifully with the parents to ensure our children walked up for Communion fully prepared to receive Christ for the first time. This is beautiful.... tender and holy. Thanks for sharing.